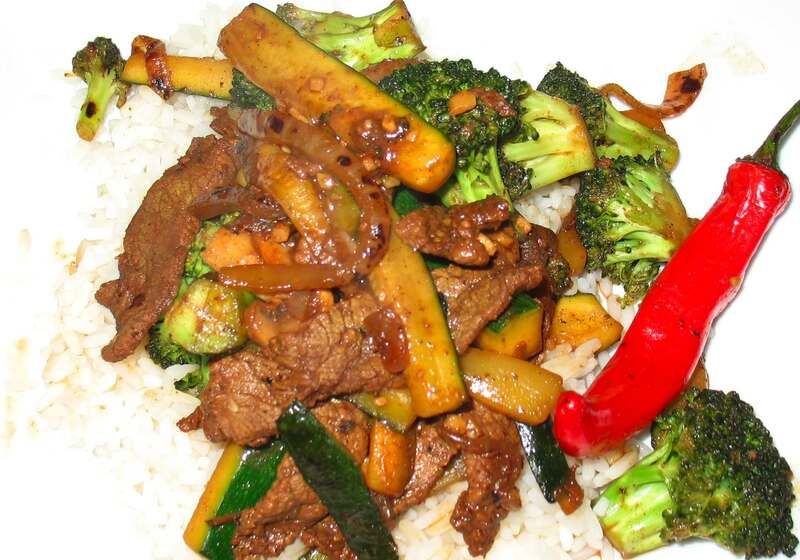 So how did this recipe compare to my previous beef stir-fry one? Well I did notice the difference in the quality of the beef, it wasn’t quite melt-in-the-mouth, but it was still really good. As for the broccoli instead of the mangetout and baby corn? I think the broccoli wins for me. The colour of the Broccoli when cooked is so amazingly vivid, so green and fresh. Adding the red chilli pepper added to the wonderful colours, and make it look so natural and tasty. 1 garlic clove, however I used the pre-minced stuff that keeps in the fridge for months, I used 1 tsp of this. 8 florets of broccoli, in the stalk of each one slice in a cross. This allows the stalk to cook better and let the flavours in. Add the ginger, garlic, soy sauce, rice vinegar, chilli powder and 5-spice together in a bowl. Mix until combined. Thinly slice you steak and add to the marinade, making sure that all the meat is thoroughly coated. Cover the bowl in cling-film, and store in the fridge. For best results leave to marinade for at least 6 hours. I left it overnight, and it was beautiful. Add the groundnut oil to the bottom of your wok under high heat, until the oil is starting to bubble. 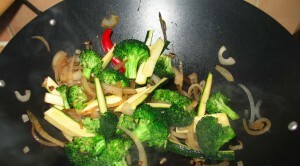 Add the onions, chilli and broccoli, for 7 minutes, stirring occasionally so they don’t stick to the bottom of the wok. Add the mushrooms, leave for a further 2 minutes. Now add the beef along with any remaining marinade. Cook for another 5 minutes until the beef is cooked through. Serve on rice, or noodles. Enjoy.